The Nittaku Acoustic Carbon Large Grip blade is made with special wood lamination technology originally used in stringed instrument production incorporated with new FE-carbon material. This construction creates a solid feel and even more power. Feel the blade in every part of your hand. Thicker wood produces solid feeling for close-to-table topspin play. This is the large handle version of the Acoustic Carbon blade. Please note-- the handle is larger but it is still normal sized. For most of my life, I have played with wood blades because of the amazing feel and flexibility they provide. For a couple years, I have wanted to switch to a carbon racket for increased power but I was afraid of losing the touch… Until Now! I found the perfect racket – Nittaku Acoustic Carbon. This racket is lighting fast but gives an unbelievably good feel on the control shots with the perfect amount of touch and vibration. 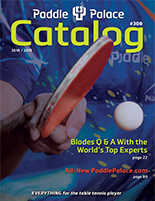 Paddle Palace has several versions of this blade – Acoustic, Acoustic Carbon, Acoustic Carbon Inner, Acoustic Carbon Inner Large Grip, and Acoustic Carbon Large Grip. Because my hands are large, I went with the Large Grip. I’m very happy with my selection and look forward to making progress throughout the year and for the rest of my playing career!